This blog is sponsored by the International Puppetry Museum - IPM (puppetrymuseum.org). This blog is sponsored by the International Puppetry Museum – IPM (puppetrymuseum.org). Welcome to the Alan Cook – A Puppet Collector’s Odyssey Blog! You are all invited. We welcome and look forward to your input and comments. Alan Cook and Jackee Marks are pleased to announce the publishing of Alan Cook – A Puppet Collector’s Odyssey as told to Jacqueline Marks with Dimitri Carter. 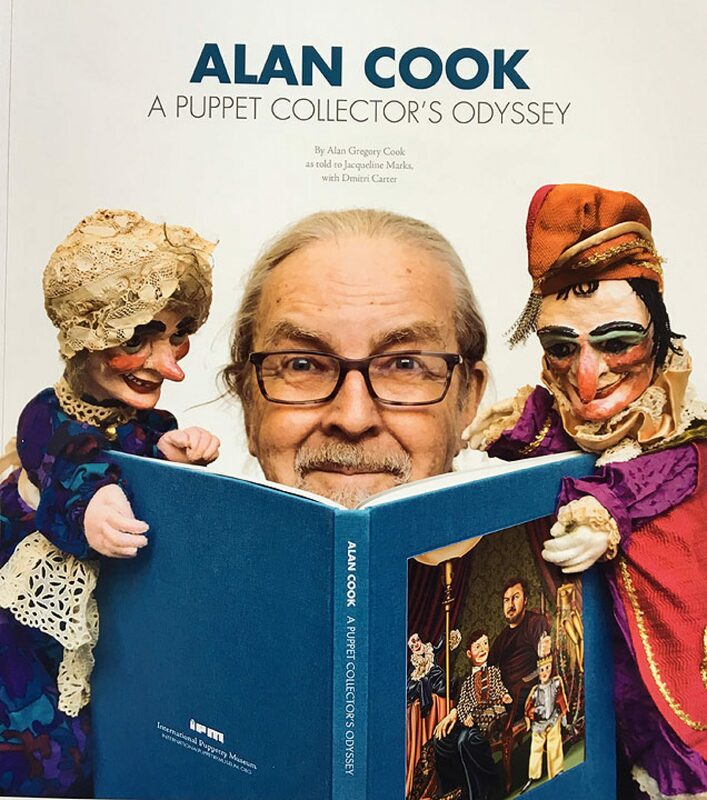 This hard bound “coffee table book” is filled with Alan Cook’s delightful stories and photos of his puppet collection and how he has acquired it. The book is 10” x 12”, contains 200 pages and includes approximately 100 full color images. Alan Cook – A Puppet Collector’s Odyssey will be ready to ship late June. The books brought to the National Puppetry Festival July 18 – 22, 2017 (Concordia University, St. Paul, Minnesota) were SOLD OUT the second day of the event! The book is $37.50 plus $5.50 shipping & handling, domestic (within the USA) International shipping will be determined. There is a limited quantity so don’t delay, Click here to Order yours today! After over two years of interviews with Alan Cook and a number of trips to the NWPuppet Center in Seattle to take photographs for the book, the publication is now at the printers and should arrive in late June. Note: Because of the high rate of spam for BLOGS, your first comment may not appear for a number of hours. Your Membership to the BLOG must be approved before your comment appears. Our apologies for the delay. I have received an advance copy of the book and it is gorgeous! So exciting. This coffee table book measures 10” x 12”. It contains 200 pages including over 100 photographs in color. The book is filled with Alan Cook’s delightful stories about his puppet collection and how he acquired the puppets. The books should be here soon after July 4. All out of state paid for orders will be sent soon thereafter. We are so excited to show you this book. Do tell your friends! Holy cow, Jackee and Alan! This is one of the truly great puppet books of all time! I can well appreciate how hard it must have been to make choices about which puppets and stories to include, but kudos for doing it with such flair. It’s beautifully designed, the photos are fabulous, and I can definitely hear Alan’s voice and artful selection of the humorous detail. I’ve already laughed out loud several times, and I’ve only begun to read. This is a treasure. Thanks so much for making it. Have a great time at the national festival! Bring lots of copies – I think they will go fast! The books brought to the Puppet Festival were SOLD OUT the 2nd day of the Event! We have more in a warehouse available. Place your order TODAY before it’s too late!! !